Here’s John’s Ice Blue T-Belly. The latest iteration of the T-Belly has thinner foil and lower rocker. 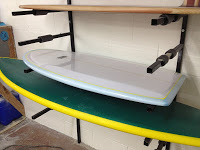 The slope-deck rails are thin, offering good wave penetration. I moved the fins slightly forward, but kept the V outside of the fins, with a progressively-deep single concave exiting the tail. There is a “hip” in the outline just forward of the fins, which is where the V starts at the rail and where the concave begins, flowing in between the fins and exiting the tail.